We are supposed to be lounging around Primrose Hill this weekend, but ALAS! Apparently we are invited to someone’s wedding. The electrician’s son’s wedding. Whom I have not met. Nor have I met the wife-to-be-on-Saturday. And the invitation was hurriedly passed to me yesterday AND WHAT IS MORE there is something on the back of the invitation asking for “no boxed gifts or vouchers”. So. You want me to come to your wedding, stranger-type-person, and give you cash. AWESOME. I am delighted. Luckily, my parents are here and they can babysit for the whole of what will be the sunniest day of the year while I am in some HALL somewhere talking to the baby in a very animated way because I will only know the baby. Everyone else will be from HARROW! And they will probably be electricians or have some sort of electriciany-type job that makes them handy with tape and fuses and what will I say to them? How is your white van? Are all your trousers low-cut at the back? Is that some sort of union-type-trouser arrangement? Harrow, Dear Reader, is very far from W2. So I am a little bit cranky. Again. And have been very busy since I can back from the Land of the Long White Cloud. My lovely parents have been staying here and it seems that the stomach bug that I give to EVERYONE in the world whom I have anything to do with struck them down too. I think I even have powers to transmit it over the internet. If any of you feel a bit queasy after reading this post, it will have been my bug. So sorry. So they have been jetlagged and stomach-bugged and have had their ears polluted from the unholy noise of the children, and they are a bit old and it has been a little bit exhausting. They were also on the couch. Can you imagine putting your elderly parents on the couch? Who does that? We do, obviously, but I can tell you that it is not the kindest solution. Anyway, they have been packed off to a very nice flat in Notting Hill with no noise and proper beds and a TV with 20 channels. Mum has lost her bra but that seems to be the only real casualty. And Dad has been arriving in the morning with fluorescent foam earplugs firmly in place. It seems to have done the trick, although makes it hard to tell him when to stop walking and turn left. We had a little party for Noah on Sunday in the garden. I painted the kids faces. I am not really skilled in that area, despite many years of painstaking makeup application. See? Ah well. We can’t all be good at everything, right? I have the power to nauseate friends and family. Asking for artistic skills may just be greedy. 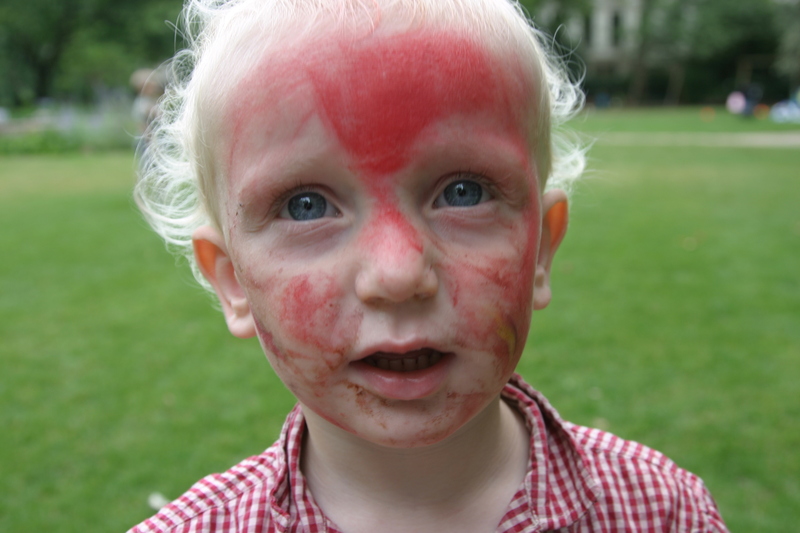 Don’t worry about the face-painting thing. 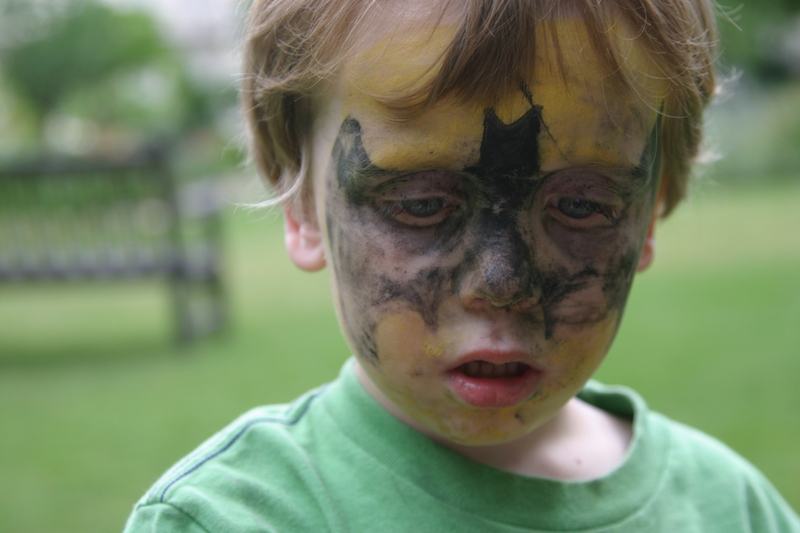 Making oneself fit to grace the outside world with lippy and liner is one thing, turning your child’s face into a bat (it is a bat, right?) is quite another. In the whirlwind of drunken bridesmaid card opening they will be none the wiser. Perhaps GJ “lost” her bra to avoid being mistaken (again) for a boy-witch? In any case, you now have a spare one hundred pounds to encase such marvelous mammeries. Crocheted Fedora is a genius. I sympathize, because although I understand it is technically possible to decline a wedding invitation, I have never actually managed to do so myself. Ali – thank you very much for my BBA! I have not been nominated for one so I shall very happily take part. And yes, the scarlet fever face was quite inspired, wasn’t it? Might attempt a lupus-face at the next gathering. Sally I think you know, deep down, that it was me who was responsible for the vomiting. My friend’s parents arrived from Auckland into London yesterday and her father started feeling ill. We all agreed it was from me. CF – you truly are a genius. Although I would rather not go at all, even though your clever ruse would fix the awkward cash part of the whole bloody boring wedding fiasco. Mum has sorted out the bra drama – she bought a £3 one from a sweatshop in a size too small. result. Sarah – I SHOULD wear a hat, as all the leopard-print ladies will be doing, but cannot be arsed. I shall instead be on the lookout for elusive clean garments. Redfox – lovely to meet you (sort of)! I have asked my husband with pleading eyes and a sad tilt of the head if I could be spared the torture of attending but he just says ‘no’ in a dad-like way. Am screwed.